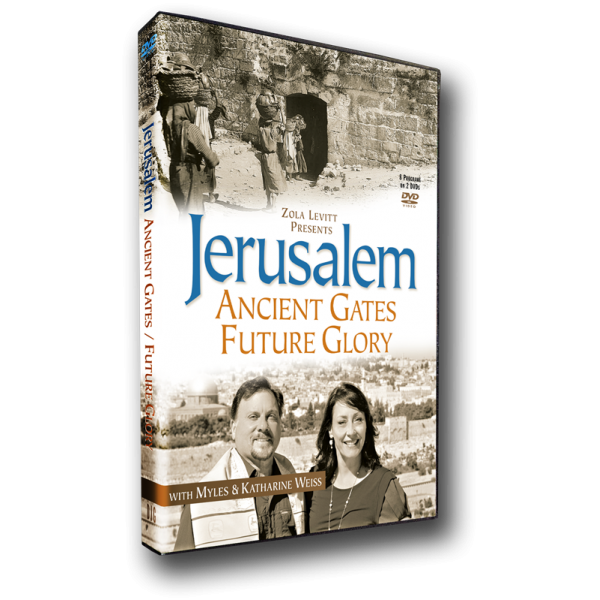 (8 programs, 2 DVDs) Myles and Katharine delve into the historical and spiritual significance of each Gate in the Old City wall of Jerusalem. Enjoy the inspirational music of Marty Goetz. Besides serving as a passage for carrying refuse out of the city, the Dung Gate leads to the Western Wall of the Temple Mount, Judaism’s holiest site. Guests include archaeologist Shimon Gibson and Rabbi Marty Waldman. The Zion Gate, leading to the Jewish and Armenian Quarter of the Old City, has seen its share of military action and was a focal point in the history of the modern Zionist movement. Guests include Shimon Gibson and Gate expert Tamar Hayardeni. David Parsons, from the International Christian Embassy Jerusalem (ICEJ), explains the eschatological (End Times) connection between Jews and Christians. The New Gate, as its name implies, is the most recent gate and gives access to the Christian Quarter of the Old City. It provides a picture of God's heart for unity. Guests include David Parsons, with the ICEJ; and fiery supporter of Israel Jan Willem van der Hoeven, director of the International Christian Zionist Center. Pointing toward Syria’s capital, the busy Damascus Gate is a window to the North and to the Moslem world. Guests include Shimon Gibson and Jan Willem van der Hoeven. Lions Gate, also known as “St. Stephen's Gate,” is where the Israeli army entered to re-take possession of the Old City in 1967. Let us pray for the Lion of Judah, Yeshua HaMashiach, to return as the King of Glory. Guests include Tamar Hayardeni, and David Dolan with Colonel Shimon Cahaner. 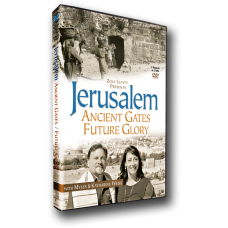 The Eastern Gate has been closed since Byzantine times in a Moslem attempt to thwart the Jewish Messiah’s Second Coming. The Eastern or Golden Gate will open again when the King of Kings returns. Guests include Shimon Gibson and Tommy Waller of HaYovel.